Visual Studio Code>Programming Languages>MDX InlineNew to Visual Studio Code? Get it now. 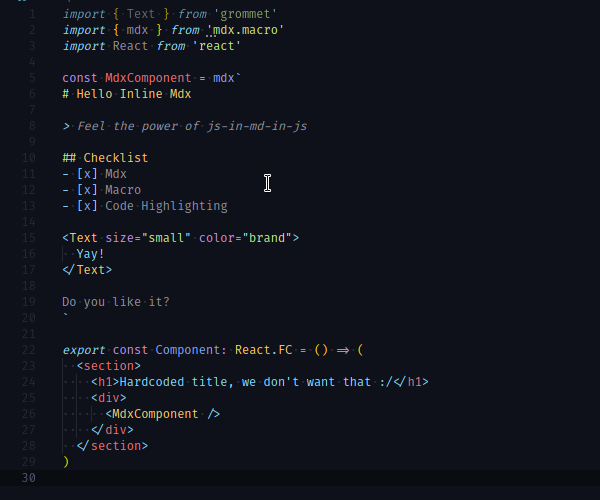 Adds MDX highlighting in inline tagged template literals. You can collocate MDX with your code and use mdx.macro or inline-mdx.macro to render your markup as html (via @mdx-js/tag). All instances of mdx or inline tagged tamplates will be detected as embeded mdx. This will be nicely colored! So why on earth anyone would need js-in-markdown-in-js? It's the same idea as usage of graphql or css/styled tagged template literals. Mdx files are great for whole articles, but what if you just need a few lines? Or want to split your content? This extension adds to your editor markdown/mdx highlighting (and whatever mdx support) in tagged template literals.